The Norm that regulates this concept is the ISO 2859-1. To apply it correctly, in first place we have to analyze the sector to which the products will be directed, because this determines the required level: for example, it is not the same level required for surgery gloves that the ones for domestic use. Besides, there has to be kept in mind factors as the protection, technical level of the product, the risks of the work to do, etc. Therefore, the ALQ level must be set by the manufacturer before the production, and kept in mind to accept or reject a shipment. Table 1. Used to determine the required inspection level, based on the manufacturing volume. 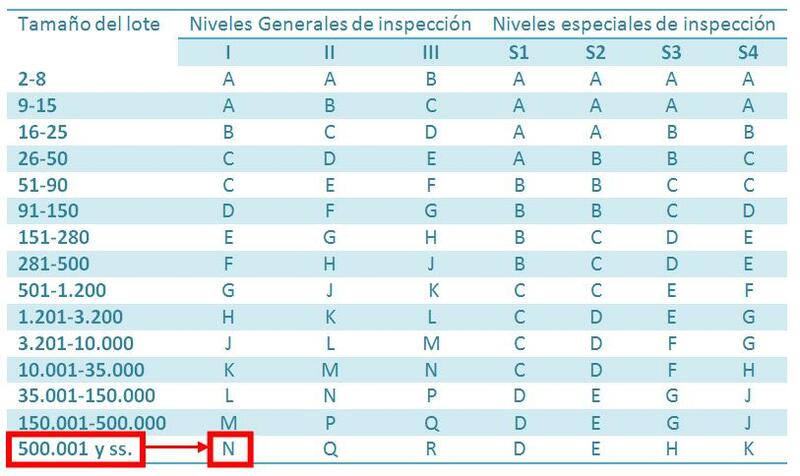 For instance, if we take a sector at which we work usually, the gloves, with a manufacturing of more than 500.000 units for set, we obtain the letter N.
In third place, with the letter obtained in the Table 1, we have to go to Table 2, which provides the size of the sampling for the level of AQL we want to guarantee. This value will give us the inspection requirement for the set to be accepted or rejected. The numeric value of AQL is lower when the accepted quality level is higher. Table 2. Indicates the size of the sampling. To continue with the previous example, we´ll take the production of gloves for sanitary use, and the Norm which regulates them, the EN 374-2, protection for microorganism, which contains the test method required to determine the porosity. According to directives given by the technical instruction NTP 938 of the INSHT, the compliance of this Norm entails the application of an AQL less than a 1.5, for level of general inspection 1. Therefore, we take the letter N obtained in the Table 1, and we go with it to the Table 2. 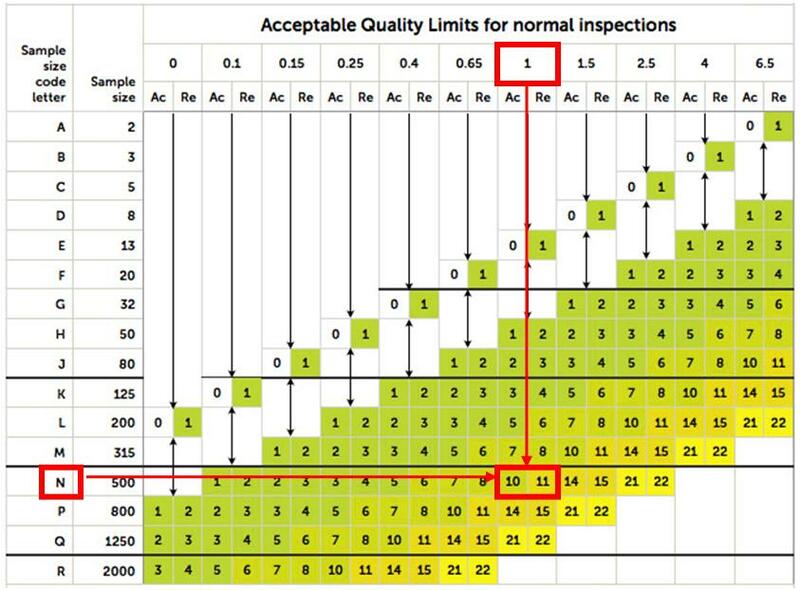 We select an AQL 1.0, which is lower than 1.5, what shall we remember, implicates that is a higher quality level. In the Table, we can see that the AQL allows a maximum of 10 failures in 500 units; with 11 failures, the set must be rejected. To sum up, it is only allowed an error of the 2%, or what is the same for this particular case, only 2 gloves could be defective in a pack of 100 gloves. It is difficult for the client to determine whether the manufacturer is accomplishing with the AQL standardized levels, maybe because they don´t have the time or the appropriate means. To solve this, there are many external organisms such as authorized laboratories, or certification and audit companies, that are responsible for the verification of these levels. It is not a certificate, but a trustworthy check. In the case of the public purchases of product, the AQL is even being established as a valuable rule. For these situations, each set should be checked and their inspection certificate attached to the merchandise, because currently it´s being seen that the AQL depends on the arbitrariness of the manufacturer, attributing a higher quality level that doesn´t belong to the provided product.